Waiting several months for my Raspberry Pi to arrive meant that I have had plenty of time to come up with potential uses for it. The Raspberry Pi caught my attention because it seems to be one of those subversive technologies that come in under the radar and changes everything. Nothing about it is truly revolutionary yet it delivers fully fledged computing with virtually the entire GNU/Linux software catalog (and others) behind it, at an unbeatable price point (roughly 35$ for a bare model B board). The possibilities are literally endless. The Raspberry Pi and its successors will be used for robotics, sensors, DIY drones, multimedia centers, and home servers to name but a few. 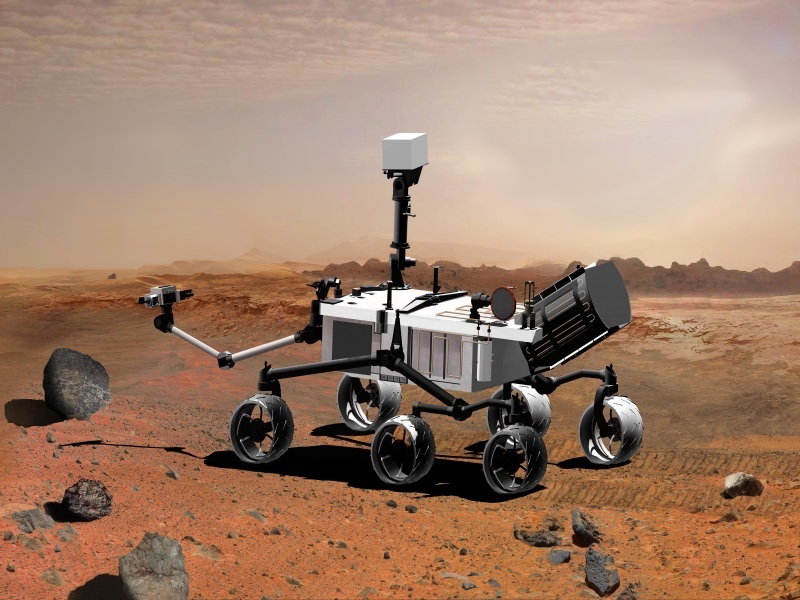 As it is an open hardware design we will probably see clones coming out of China by the shipload. In some way it also seems to fit in nicely with the whole wimpy core trend for data centers (which I admit is not uncontroversial). My own plans for the device are slightly more modest though. Personally I’m interested in using these devices as an always-on home server, as an ultra small footprint media center (if this particular use pans out) and for work I would like to investigate using them to drive the wall screens which are proliferating all over the office. I have avoided having a server running 24/7 at home for a number of reasons. They take up space, are noisy, cost money to run (admitedly not a huge deal), and cost a not insignificant amount of money to buy. The Raspberry Pi negates all these objections handily. It takes no space, makes zero noise, pulls almost no power (idle or otherwise), and comes in under 100$ with all accessories. I haven’t tried this yet but it looks promising. 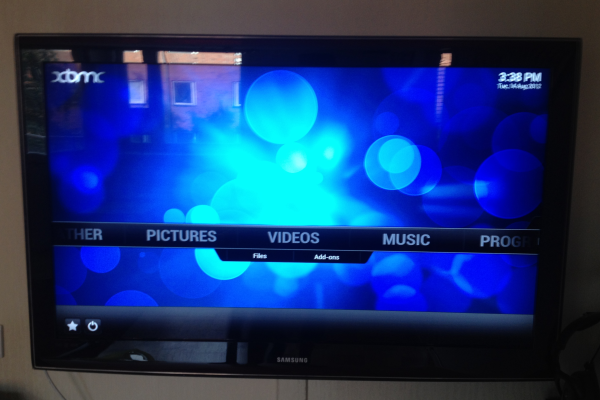 If the codec support is there via XBMC and the performance is up to snuff it should handily beat the XBox. At Active Solution where I work we have begun installing wall screens to display project relevant information such as Trello boards (digital post-it replacement) and information piped to web based dashboards from our various issue tracking systems (depends on the client). Currently we have dedicated laptops serving each wall screen which is workable when we only had two. As the number of wall screens grow this approach is quickly becoming untenable. I decided to try the Raspberry Pi out as a replacement for all those power-hungry laptops. 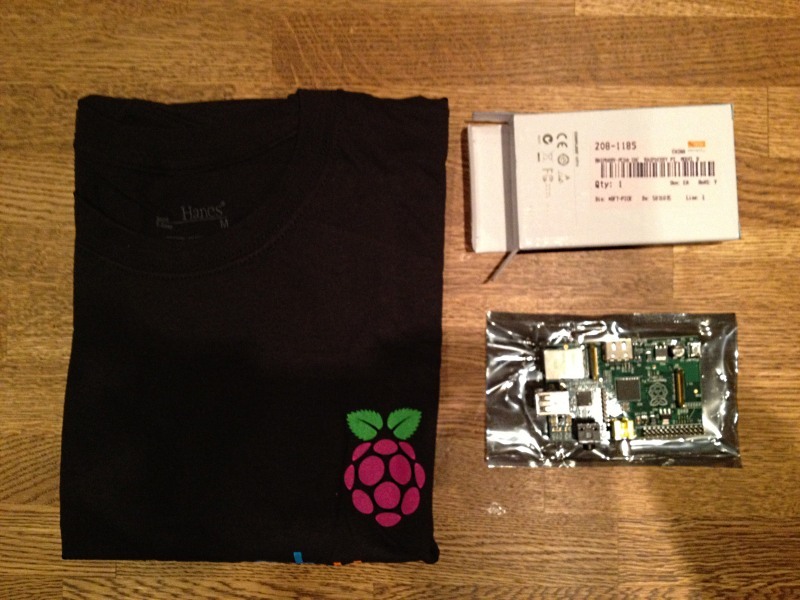 The Raspberry Pi comes with nothing, not even a case, included (except a nice t-shirt) so you will need to get a couple of things in order to get started. I will not go into great detail about how you get the Raspberry Pi up and running save to say that it was a breeze (check out the Raspberry Pi foundation quick start guide). The Debian Squeeze Linux image I opted for was ready to be written directly to the SD card (no installation needed). All you need to do is change the default password on first boot. It took literally no more than 20 minutes to download the Linux image, write it to the SD card, assemble the Pi and hook it up to the monitor. The only snag at this point was that we had to enable a previously disabled network socket close to the intended screen. A bigger problem turned out to be the supported browsers on the Pi. As of this writing none of the browser versions available (of Midori and Chromium) supports HTML5. This is a problem for us as the dashboard software we are using (our own as well as Trello) requires HTML5 support. 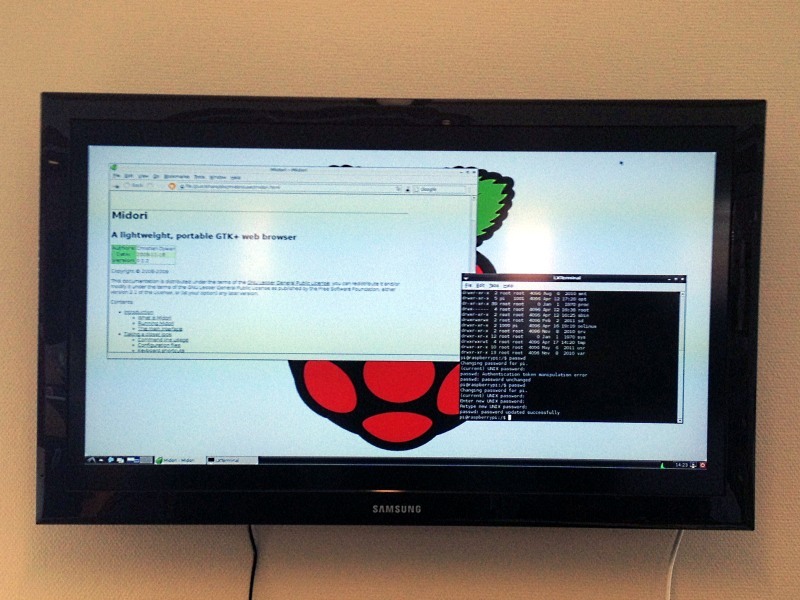 Raspberry Pi (with Debian Squeeze and LXDE desktop) on wall mounted flatscreen. Not one to be discouraged I soon had an idea for how to get around this limitation. Even though we might conceivably upgrade to touch screens some time in the future our wall screen dashboards are non-interactive and simply display a pre-set web page (refreshing periodically). I recently attended an in-house seminar conducted by my eminent co-workers Chris Klug and Robert Folkesson on among other things the open source HTTP service framework NancyFx. Here was a light weight solution that could be used for serving up images of web pages rendered in a browser that supports HTML5 to a wall screen connected Raspberry Pi. It was of course also a great opportunity to learn more about NancyFx. 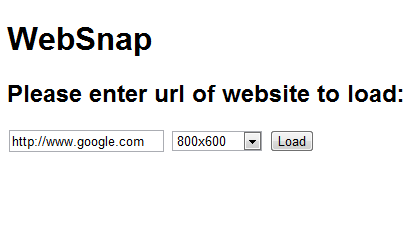 I began outlining a web page snapshot service named WebSnap and soon had a prototype up and running. As our company specializes in Microsoft technology this was implemented as a WPF application in Visual Studio 2010. At the moment of writing it is functional albeit not quite “done”. I will outline the general idea here and plan to post the full source once it has matured somewhat. For simplicity (most certainly not for scalability) I opted for simply capturing screenshots of a pages rendered in a WebBrowser control hosted in a WPF application. The ideal would of course be to render pages fully off-screen but for simple proof of concept this seemed a bit excessive. If anyone has any suggestions for solving this particular problem don’t hesitate to suggest it. All you really need to start to serve data over HTTP is to implement a NancyModule. Here I leaned heavily on an excellent blog post by Andre Broers on self hosting Nancy and utilizing the SuperSimpleViewEngine included with NancyFx. The full source includes view models, views and various support classes which I have not include in this post. Please refer to Andre Broers excellent post for an overview of how to do this. SnapModule here inherits from BaseModule which in turn inherits from NancyModule. As you can se we are setting up a number of routes with different “handlers” attached. // Do we need to refresh the image? TimeSpan imageAge = File.Exists(imagePath) ? // Load the page in the web browser. // Wait for the website to load on the UI thread (max 10 sec). // Capture image from the web browser. The reason for marshalling all interaction with the WebBrowser controll via the dispatcher is that it is owned by the UI thread and will not take kindly to being manipulated from another thread. The NancyFx module is not going to be running on the UI thread so hence the marshalling. This of course creates a bottle (pain in) neck when we try to scale the solution up. Luckily only so many wall screens will fit in the office. When you first navigate to the host address you will be presented with a landing page where you can enter the page to snapshot and the size of the snapshot (at the moment this is approximate). When you press load the server will be instructed to load the requested page into the hosted web browser (HTML5 compatible) and will reply with a page rendering that image full window size and centered. If the same client (or another) request the same page (at the same resolution) again the same image will be returned unless the image is older than 5 minutes in which case another will be captured. 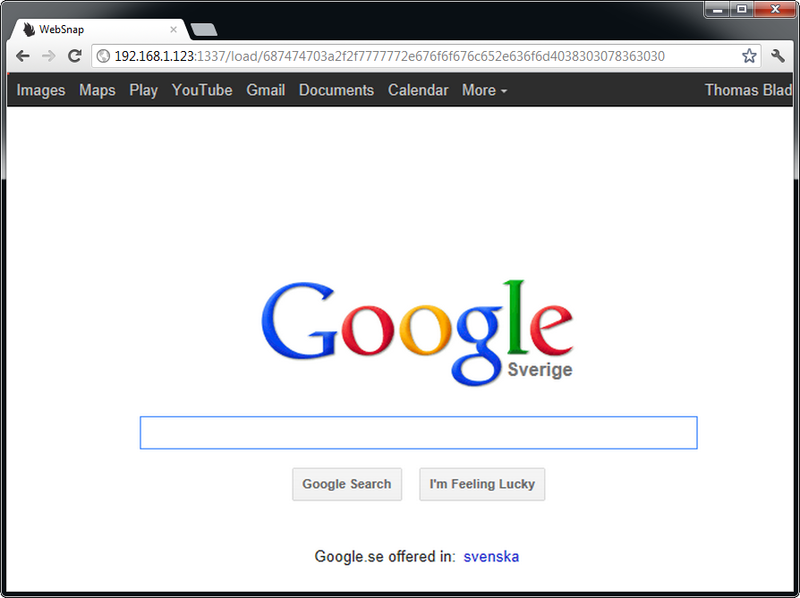 The end of the url here is a hexadecimal string created by simply transforming http://www.google.com@800×600 to 687474703a2f2f7777772e676f6f676c652e636f6d4038303078363030 (each ASCII digit = two hexadecimal digits). Crude but effective (if not exactly memorable). At this point this is essentially a somewhat ugly hack. No consideration has been given to how this is supposed to handle increased load or whether or not it is secure. If it will be used it will be used on an internal network for the sole purpose of feeding a handful of wall screens with web page snapshots. 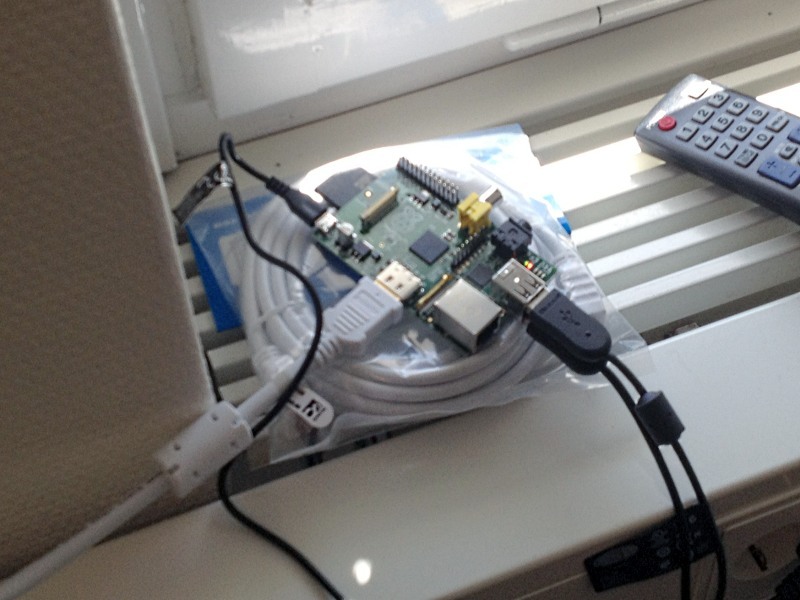 With this I conclude this report on my initial adventures with the Raspberry Pi. I hope to post more on this subject as my experience with the device grows and my various projects mature.